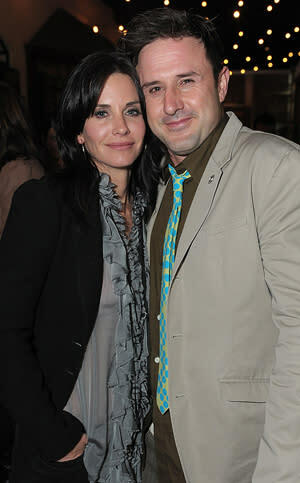 There have been some nasty Hollywood divorces, but don't expect David Arquette and Courteney Cox Arquette's to be one of them. When David, 40, filed for divorce from Courteney, 47, last Friday in Los Angeles, the "Cougar Town" star did the same thing — only it took an additional day for her papers to be discovered. In her legal filing, Courteney lists the same reason for their split ("irreconcilable differences") and also asks for joint physical and legal custody of their daughter Coco, who turned 8 on Wednesday. There is speculation that the amicable exes actually filled out their paperwork together as they both note that they are representing themselves, without lawyers, in the divorce. However, David's papers were dated March 23, 2012 while Courteney's had Friday's date, June 8. Also of note in both filings, they list their separation date as December 31, 2011 – although they announced what they called a "trial separation" back in October 2010. Courteney's filing had an additional request that her name be restored to Courteney Cox, dropping the Arquette. The odd couple fell in love on the set of "Scream" and married three years later in June 1999. During their marriage they were open about their differences with Courteney telling InStyle: "We've done couples therapy in the past. We're not lazy about our marriage. We have the same arguments we've had for years." They were dogged by tabloid rumors for months before they announced their separation in 2010. Soon after, David explained the reasoning behind their split to Howard Stern, saying: "[She said] 'I don't wanna be your mother anymore.' I appreciated that. I respected it. I've been going to therapy. I'm trying to grow up. I'm trying to be true to myself. Trying to figure out myself and my world, as is she." Their split has never been bitter – at least publicly. In January, Courteney told People: "He's my favorite person in the world. He's my best friend. No matter what happens in our future, he's my very best friend."